After filling up with gas we hightailed outta Hurricane headin’ north to Cedar City on I-15. As we passed the small towns of Browse, Pintura, Snowfield, Kolobo Canyon and New Harmony signs warned “drowsy drivers” to “use next exit”. We didn’t fit into that category at this point so politely ignored them. 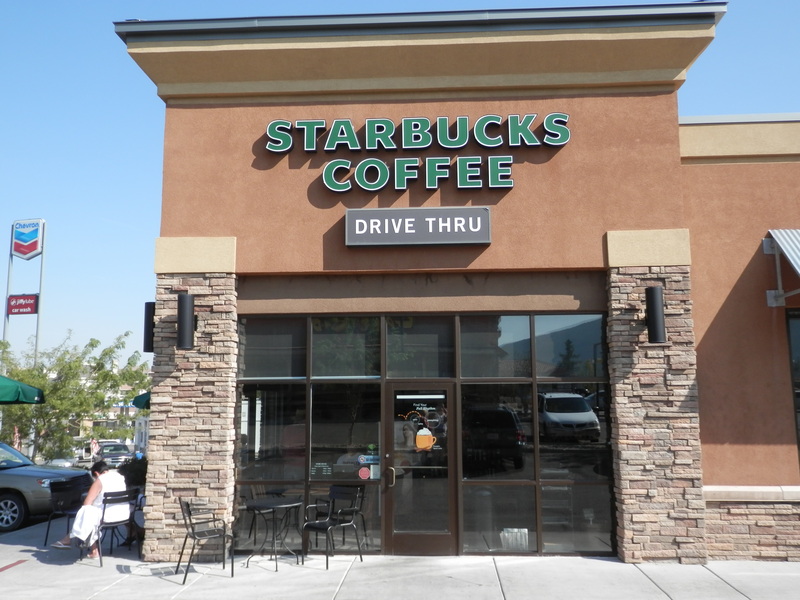 We pulled off at exit 57 for Cedar City, self-styled “Festival City USA” (it does host an annual Shakespeare Festival as well as a music festival so I think it’s entitled), and spotted Starbuck’s where we had a breakfast of bagels and cream cheese and lattés. The incomparable Townes Van Zandt was singing “Pancho and Lefty” as we entered (though, sadly, not in person as he left us at a criminally young age fifteen years ago). On our exit Sting was crooning “every step you make I’ll be watching you”, which was a little more disconcerting. We drove around Providence Plaza with its incongruous lighthouse (though I believe that there is a link with Rhode Island). I spied a smart looking bookstore entitled Deseret and immediately bounded in. However, it did not take long for me to decipher that this was not a bookstore in which I was likely to find any underground, or even secular, literature. The devotional muzak, clean cut, grinning staff and shelves of Mormon tracts hastened my exit and reminded me that we were still in the heart of Utah. Turning off the I-15 we took the U-148 towards Panguitch. 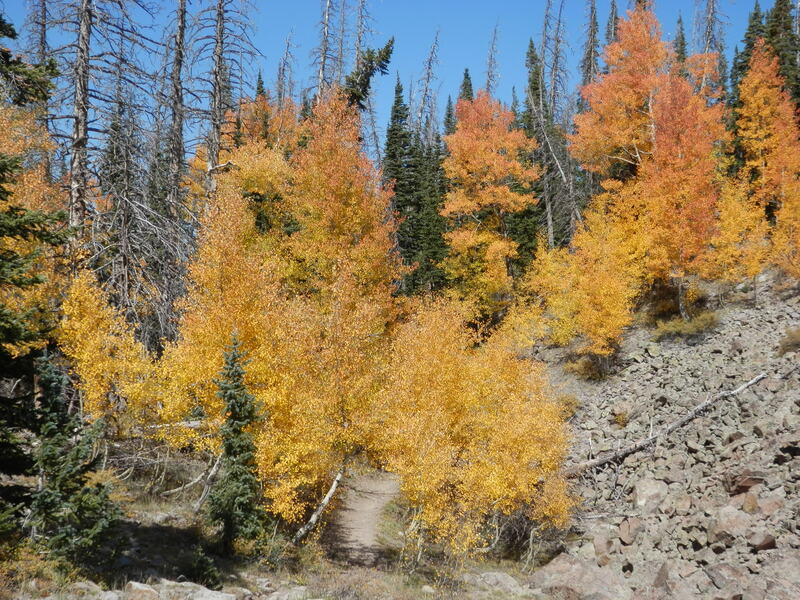 Despite the heat, the trees in the Dixie National Forest were beginning to show signs of Autumn’s approach. We arrived at the Cedar Breaks National Monument, a kind of mini-Bryce Canyon, just in time to catch a talk by a park ranger from Akron, Ohio on what to do, or rather not to do, if we met a brown bear on one of the area’s trails. Essentially, it came down to the acronym SCRAP – we shouldn’t stare, call, run, approach or panic – now I think I could make a passable attempt at the first four but might just struggle with the last. Anyway, should you come across a brown, or for that matter, grizzly bear on your morning commute or during your weekly shop, please bear in mind the advice I have kindly dispensed above. Hopefully, you’ll be as lucky as us and not meet any. But it’s as well to be prepared. We decided to take the Chessman Ridge Trail, a two and a half mile loop at over 10,000 feet. The altitude caused us to catch our breath intermittently and my heart has never pounded so much – apart from that night with Jennifer Aniston in a motel room in Bakersfield. Chipmunks nipped in and out of the bushes in front of us, though I was a little disappointed that we didn’t hear a single rendition of Ragtime Cowboy Joe. I’m referring here, of course, to the original band, not the modern team led by Alvin. A party of local schoolchildren passed us in the opposite direction, and I couldn’t resist warning them to watch out for the bears. But kids are too streetwise these days to be freaked out by such news. I think they felt a little sorry for me. Ah well. The most alarming moment, however, occurred with less than half of a mile of the trail left when both Janet and I realised that we couldn’t wait to get back to the visitor centre to take a leak. Whilst I resolved my particular issue in one of the many bushes on the side of the trail, Janet felt it necessary to pick a precarious spot on the side of a steep cliff upon which to relieve herself. For those readers of a delicate constitution I will not give any more details other than to say she somehow managed to maintain her balance and dignity (just). Nor do I have any photographic evidence. Leaving Cedar Breaks we took U-143 towards Panguitch, a lovely road with cedars and pine trees turning yellow and orange almost before our eyes. 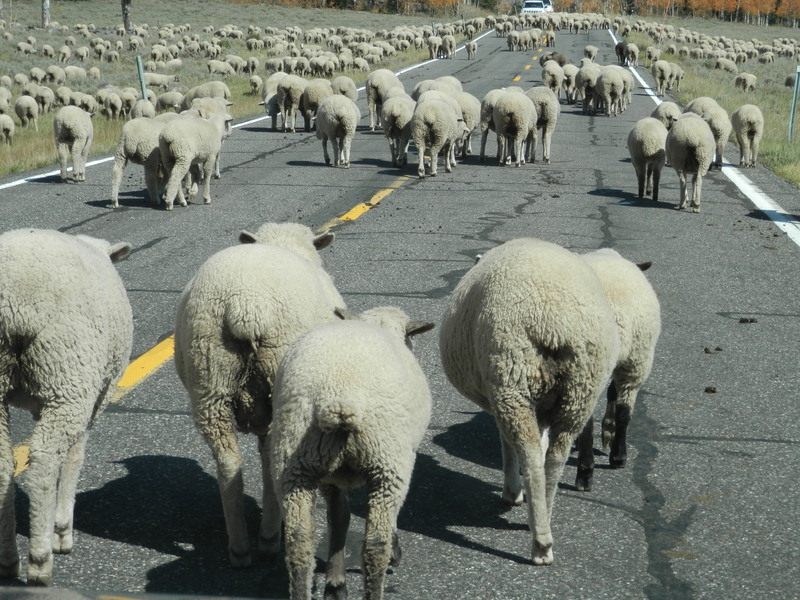 However, before very long we encountered, as far as the eye could see, hundreds of sheep striding down the road in front of us. They were clearly intent on crossing from a field on one side of the road to another, but not before they had gone for an afternoon stroll in the middle of the road first. There was no shepherd to be seen and they had little inclination to move out of the road other than in their own good time. Eventually, they dispersed, not least on account of a driver overtaking us and heading at speed for them. Perhaps he was a local and that this was the appropriate way to scatter them, but it seemed cruel and risky to us townies. At least we could now proceed slowly, avoiding the stragglers with ease. 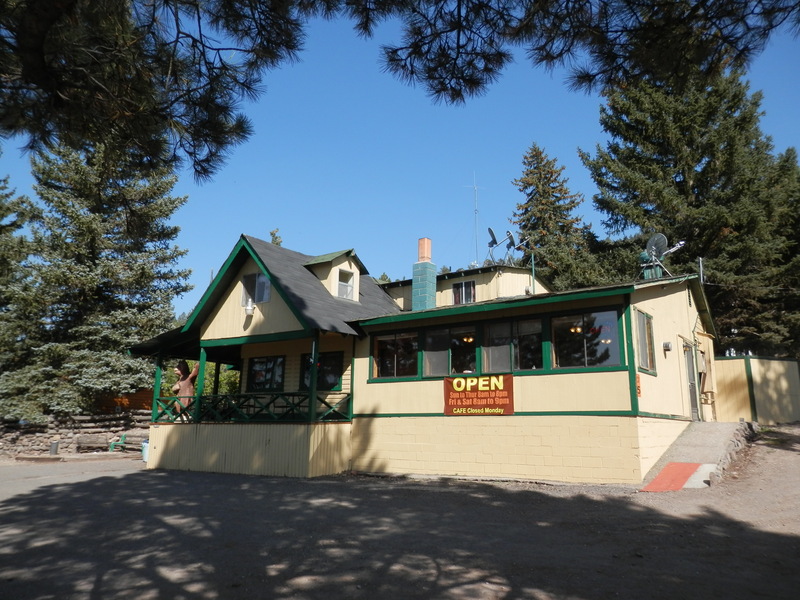 As lunch had been no more than a granola bar at Cedar Breaks we were hungry by mid afternoon and grateful to come across a small restaurant at the Bear Paw Fishing Resort on the man-made Panguitch Lake. If the hearty food was not welcome enough, the proprietor proceeded to slap a map of the region down on our table and point out a host of potential places to visit in addition to those we had already planned to see. The road trip was getting longer by the day. What struck us most on approaching Panguitch were the wide roads and number of single storey houses and trailers. 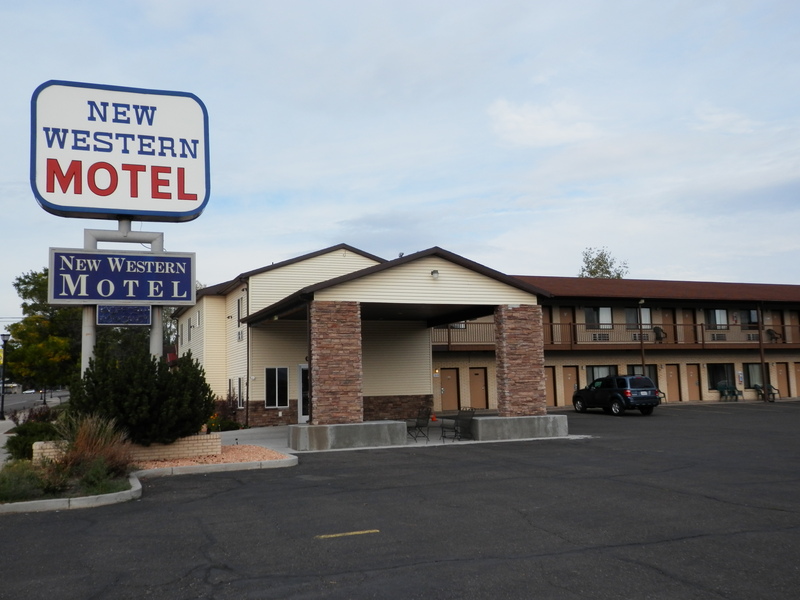 We found the New Western Motel easily enough and were pleased to discover that, rather than the single motel room we had expected, we had been placed in a newly refurbished suite with separate lounge and bedroom. Equally surprising was the fact that it was run by Indians – no, not the Navajo, Hopi or Zuni, so prevalent in the southwest, but Hindus. 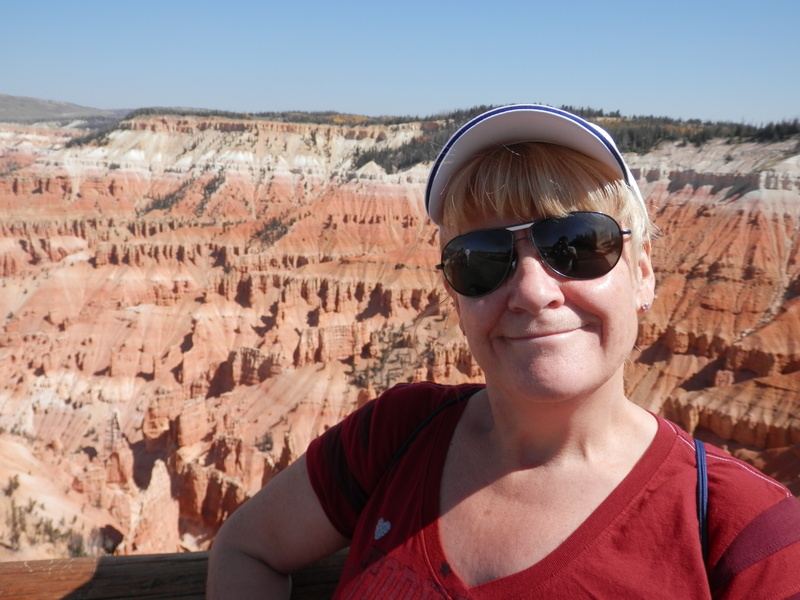 A much anticipated visit to Bryce Canyon awaited us on the next day. This road diary is primarily about just that – the road. Although, in one sense, the purpose of the road is merely to link one natural wonder after another, it is that act of movement, through time and space, and the sights, sounds and adventures that inhabit them, that is the focus of these articles. So I will not be exclaiming at length about the extraordinary parks and canyons that we are visiting. In fact, I don’t really have the words, or at least the time to find the right words, to describe some of the most beautiful spots on earth, let alone the United States. Moreover, I hope that the photographs that will increasingly feature in these pieces will speak more eloquently than ever I can. Hurricane, Utah, whose culinary delights I have already commented upon, was our base for Zion National Park, which we visited on our second full day. It is not as close as funkier Springdale, effectively the gateway to the park, but still convenient and much cheaper. Our trip to Zion was prefaced by a sumptuous breakfast in Bear Bites, actually room 116 in the Travelodge, one in which it might have been difficult to swing a kitten, let alone a fully grown cat. Here we banqueted on toast, juice and coffee – we hadn’t the confidence to negotiate the waffle machine – with an assortment of non-English speaking residents. One mature German couple sat down next to us with four slices of toast. The woman then produced a carrier bag containing a whole cucumber and half a green pepper – complete with seeds – which she cut up and scraped onto the toast. No accounting for taste. As we were packing the car, two surprisingly beardless, but not bandana-less, bikers were lovingly tending to their Harleys before setting off on the next leg of their own road trip. In the short drive to Zion we passed Doggy Dudes Pet Care. Oh to have had a pooch in tow at that point. On arrival at the entrance to Zion we purchased an annual pass for all US national parks for the phenomenally low price of $80 (total), representing a huge saving even by the end of this trip. Had I been a few years older it would have been $10! British visitor attractions please take note. 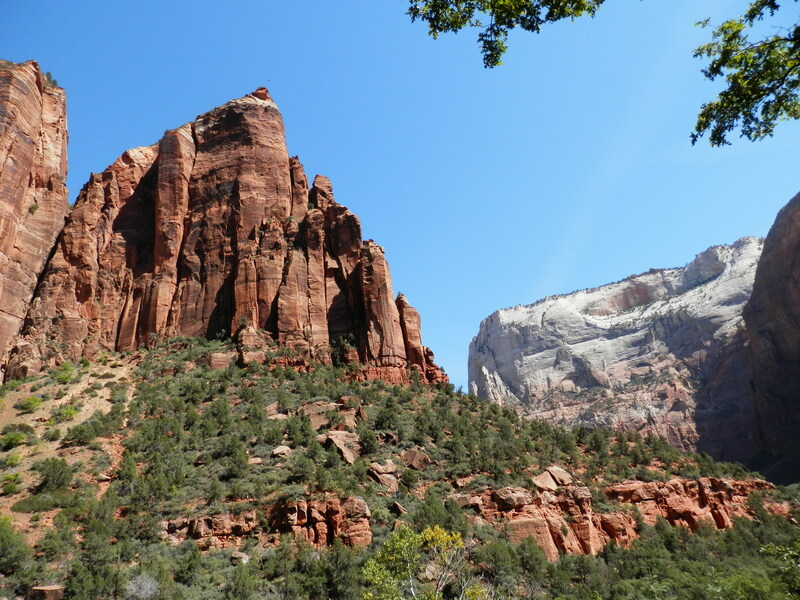 We parked at the visitor centre and took the shuttle to the furthermost point of the park, the Temple of Sinawava, and worked our way back, hiking several trails, including Riverside, Weeping Rock, the Lower Emerald Pool and the Pa’rus Trail in near hundred degree heat. 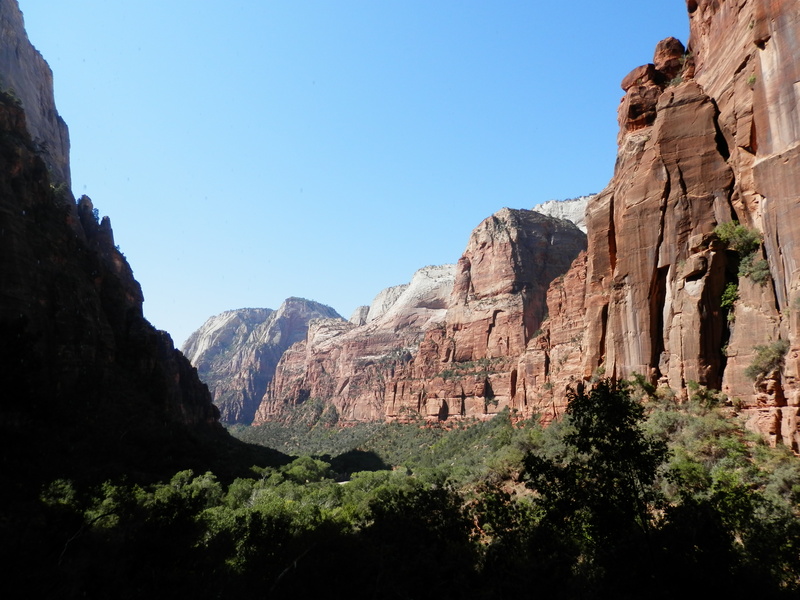 Zion is not dissimilar to Yosemite in that it contains awe inspiring cliffs and rocks, lush vegetation, and flowing rivers and waterfalls (though the latter were not much in evidence today). In fact, I preferred it to Yosemite, proclaiming it the loveliest place I had ever seen. I was to change that judgement more than once over the next week. We called at Springdale on our return to the motel and found it an urbane and attractive town. Were we to visit again this would be our base. 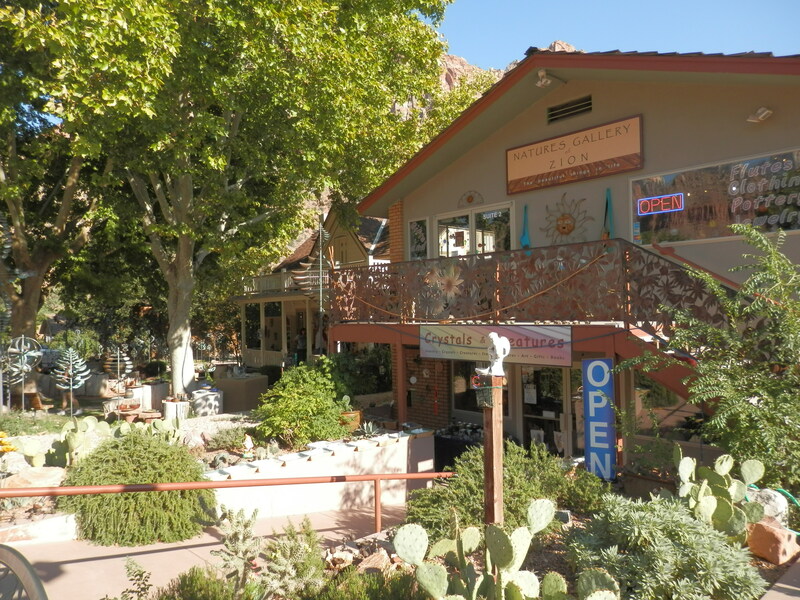 We could not resist the Bumbleberry Inn where we rewarded ourselves for our strenuous walking all day with a slice of the “famous” (how is everything “famous” or even “world famous” in America?) bumbleberry pie. It might not truly be famous but it was delicious. Apparently, they grow on giggle bushes, which is pretty cute. The gourmet evening was completed by a Domino’s pizza and wedges back in Hurricane – across the road from the infamous Barista’s – washed down by beer from the local gas station. Wine remained out of the question. The road to Panguitch, Utah beckoned the next morning, where the story will continue. We had been warned that high quality dining options were severely limited in Hurricane, Utah. Moreover, it was likely to prove difficult to obtain an alcoholic drink – beer possibly, but certainly not wine. And those warnings were sadly endorsed over the next few evenings. It all began when we went out to dinner on our first night. Having consulted TripAdvisor and selected its number one restaurant, a pizzeria in a cinema complex around a mile away, we were feeling optimistic. Armed with the respective street numbers we set off in our search for the cinema. We found this easily enough – but no sign of any pizza restaurant. We walked a little further and then around the whole area, all to no avail. It was only when we returned to the motel and read the fulsome TripAdvisor reviews a little more carefully, that we discovered that it was only a mobile street wagon that set up stall during daylight hours (and even then not on a Wednesday)! We headed off back in the direction of the motel, only mildly disappointed because we had spotted an attractive looking restaurant called Barista’s on the way down. And by the time we had been sat at our table and started to read the hundreds of alleged customer testimonials claiming that the pizza and ice cream, along with many other items on the menu, were the best on the planet, we had struck lucky in adversity. I like to think that I am reasonably streetwise, and do not often get hoodwinked by confidence tricks (I’ve conveniently forgotten the guy on Fisherman’s Wharf in San Francisco who screwed ten bucks out for me for “cleaning” my boots), but this proved to be one of my dumbest moves. The teenage waitress in shorts who clearly wanted to be anywhere else took our drink order. Conscious already that wine was out of the question, we asked what beer they had. With a huge sigh the girl said “St. Pauli” in a “take it or leave it” manner, so St. Pauli it had to be. Now, although I didn’t articulate it immediately, I was familiar with this German brew and suspected that it might be non-alcoholic. After the girl had yanked the bottles out of the fridge and slapped them down on the table, and we had taken our first sips (it was too unpleasant to gulp), we knew it. The food, whilst not inedible, also fell way short of the absurd praise scrawled over every inch of wall space (the staff must have had great fun fabricating that piece of fiction). My miniscule portion of fish and chips was delivered in a cereal bowl and Janet’s enchiladas came with no accompaniment whatsoever – not a hint of beans, rice or sour cream. The “service” remained surly and peremptory. Indeed, I think it might have been the first time I had eaten in America without being asked continually during the meal by the server whether the food was acceptable. To add insult to injury, on reading both TripAdvisor and Yelp reviews back in the motel, we read a lengthy litany of furious, even vicious comments about the food, beer and staff attitude. And yet it had looked so appealing from outside. The words book, judge and cover sprung to mind. We consoled ourselves by purchasing a six pack of beer in the local gas station, though even this was of low strength (Bud Light, Coors Light and the like). This was not, however, why I got to sleep so easily that night. I can thank the account of Joseph Smith’s revelation in the Book Of Mormon for that. Having exhausted the full extent of Hurricane’s gourmet offerings on that first evening, we played safe on the following night by buying in a Domino’s pizza, washed down again by insipid beer. We were no more successful in hunting down a bottle of wine to have with our evening meal on the following two nights in Panguitch. Raids on assorted supermarkets and gas stations proved equally futile. Only the dining room in the lodge at Bryce Canyon proffered a wine list, but, of course, that was at lunchtime and we were about to embark upon a prodigious hiking expedition that afternoon. 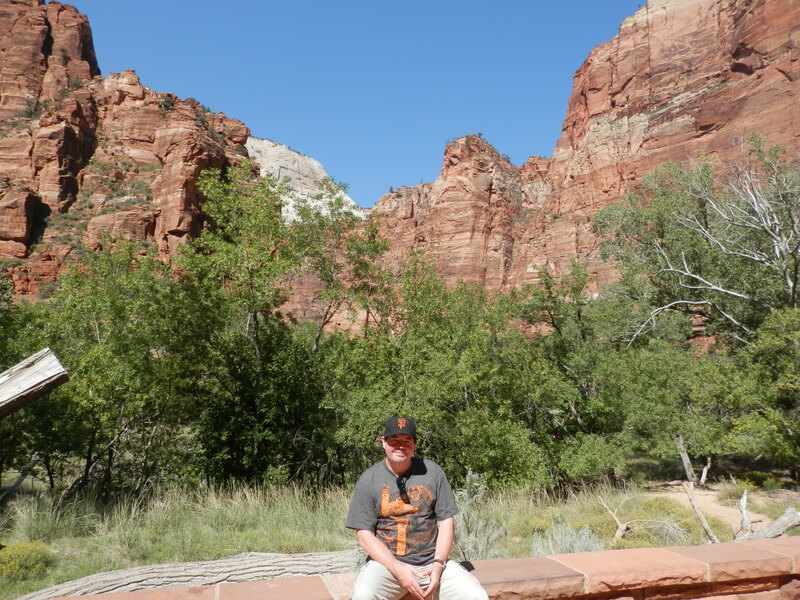 Whilst our stay in Utah was, in all other respects, wonderful, with visits to Zion and Bryce Canyon National Parks, Cedar Breaks National Monument, Red Canyon and Pink Coral Sand Dunes Park, our first swing into Arizona meant one thing above all other. No, not Lake Powell or the Grand Canyon but an opportunity to partake of one of the most civilised pursuits available to humankind – consuming a glass of wine. Having got that off my chest, it is time to return to the true hero of this diary – the road. And the journey between Hurricane and Panguitch had some interesting moments. Firstly, apologies to Brigham Young for the deliberate misquote, but it seemed as apt a title as any for the drive from Las Vegas to Hurricane, Utah where we were to spend the first two nights of our road trip. It got off to an electrifying start …………………….. with a lie-in and a spa bath. Making the most our deluxe room in Mandalay Bay, I was also able to complete the first post of my road trip blog. We checked out at the latest possible time and collected the car from valet parking, when the guy who delivered it to us unaccountably disappeared before I was able to make his day by dispensing my customary $2 gratuity. Within a couple of minutes we were on the I-15 north in the direction of Salt Lake City (401 miles). It was already very warm and sunny, with temperatures forecast to tickle 100. Locating a country music station on the car radio proved more difficult than anticipated, and after rejecting around 20 stations, spewing out everything from hip hop to power ballads, the comforting tones of Kenny Chesney took over. We had landed on 955 FM Vegas Country KWNR and life was good. The landscape quickly gave the impression that a race of furious giants had ripped up and stamped upon it at some time in the distant past, leaving a jumble of cliffs, hillocks and mounds of varying sizes and colours. We passed through the Moapa Indian Reservation and alongside the Valley of Fire State Park and Lake Mead National Recreation Area before arriving, 85 miles and 70 minutes after setting off, at the town of Mesquite, Nevada. We cruised through the main street in search of a suitable lunchtime dining option. The signs were gloomy until we spotted Peggy Sue’s 50s Style Family Diner. Dave Gorman, the English comedian, whose book Unchained America recounted his mission to cross the USA “from sea to shining sea” without paying even a cent to “the man”, would have been proud of us. This was the sort of place you should eat at on the classic road trip. And Peggy Sue’s was indeed a classic. We were greeted with Laurel and Hardy on the TV at the end of the restaurant and Roy Orbison on the jukebox. The walls were liberally adorned with photographs of movie stars (Marilyn Monroe and James Dean amongst them) and Elvis (obviously), US flags (equally naturally), 45rpm discs, vintage Coca-Cola bottles and metal advertisement signs. In addition to the customary condiment containers, and in the unlikely event that conversation should slacken in the few short minutes before your order arrived, each table had a series of books on it by Ben Goode, amongst which were How to Cope when you are surrounded by IDIOTS…….Or if you are one, How to Share a Bad Attitude and The Fine Art of Worrying. They, and many others, could be purchased at the till for a measly $7.99 each. The waitress was loud (in a good way), enthusiastic and attentive, which set me wondering, not for the first time, why her British counterpart invariably demonstrated the opposite characteristics. And then it occurred to me – why not sack all restaurant waiting staff in the UK and replace them with the London 2012 Games Makers? Moreover, they could work for free – there’s one you hadn’t thought of, Mr Cameron. In fact, the idea could be replicated in other industries. 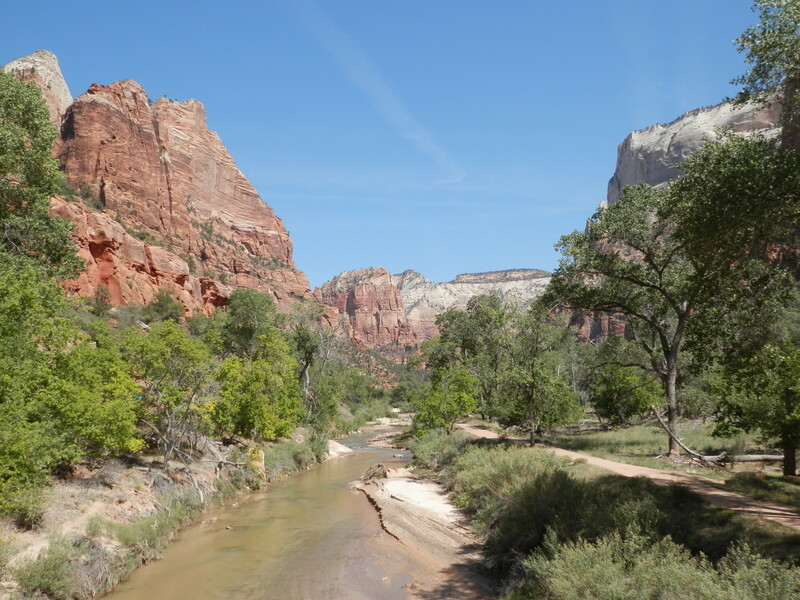 Shortly after we resumed our journey, we were joined by the Virgin River which wended its muddy way through the steep cliffs on either side. It is often said that beautiful American roads are too often scarred by huge, garish billboards, but, advertisements for fast food joints, motels and politicians aside, the prize for the daftest sign today must have been the one that advised us to “Watch for Rocks” The entire landscape comprised rocks of various shades of red, orange and brown! As we entered Utah where, according to the welcome sign on the state line, our life was about to be “elevated”, we lost an hour (moving from Pacific to Mountain time) but gained a degree (it was 99 now). We stopped for coffee in St. George, an attractive and civilised town with two bookshops (always a good sign for me) and many public art works, including lovely bronze statues scattered around the main square where gleeful children froliced through water features. St. George is home to the dazzlingly white Mormon Temple , the only Latter Day Saints temple completed during Brigham Young’s lifetime, giving it a special place in the Mormon world. We decided not to visit, partly on the advice of our guidebook which advised that non-Mormons were not permitted to enter, but also that any caller to the adjoining visitor center was as likely to leave on a two year mission to Mozambique as be sold a guidebook. Besides, this particular pasty-faced Brit would rather escape the heavy hundred degree heat for the comfort of the air conditioning in the car. We left I-15 at junction 9 and took the road leading to Zion National Park. After nine miles we arrived at the Travelodge in Hurricane where we would be staying for the next two nights. Our unusual dining experiences there will have to wait for the next article.